Save up to 80% on pre-owned Respironics Cough Assist T70 ventilators. 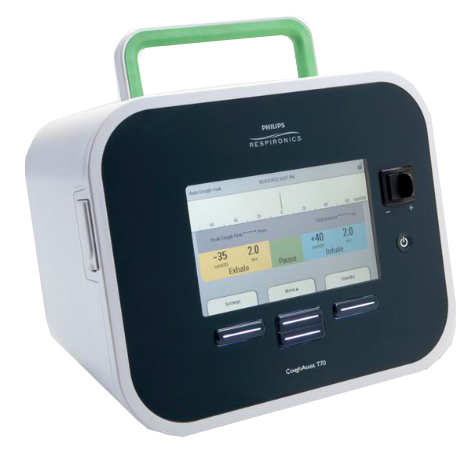 CoughAssist T70 clears secretions from the lungs by gradually applying positive pressure (insufflation) to the airway then rapidly shifting to negative air pressure (exsuffation). This shift in pressure creates a high expiratory flow, that simulates a deep natural cough. Instead of introducing an intrusive suction catheter to the airway, air is delivered non-invasively through a mask, mouthpiece, or adapter that allows the device to function with a endothracheal or tracheostomy tube. Staying out of the airway, reducing the risk of injury or infection. The T70 automatically adjusts to the patient's breathing patterns for enhanced breath delivery. It allows more control of therepy and a comfortable more natural treatment. The T70 records activity to a standard SD card for retrieval. With DirectView software, Tidal Volume, Peak Flow, Oxygen Saturation, and other details can be read to assist in clinical decisions.